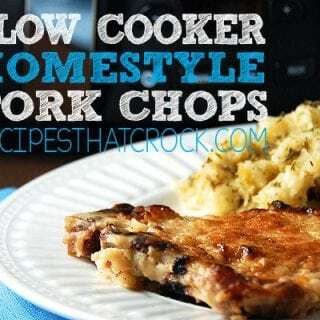 Slow Cooker Homestyle Pork Chops - Recipes That Crock! 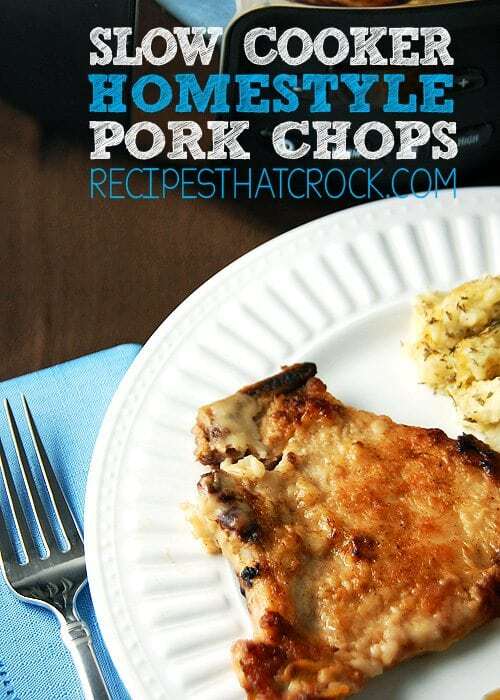 Are you looking for a flavorful recipe for some pork chops? I have you covered with these Slow Cooker Homestyle Pork Chops from Gooseberry Patch’s Speedy Slow-Cooker Recipes . So grab your slow cooker and get ready to have some mouth watering, fall off the bone pork chops! We do most of our shopping at our local Ruler Foods (Kroger brands a MUCH cheaper prices…we heart Ruler), and they have these awesome Manager’s Specials every week or two. It has become part of our routine to take a quick scan of the meat display for those beautiful orange stickers. This go ’round, our friendly little orange manager’s special sticker gave us 5 yummy chops for $3.29! It was almost half off! Woohoo! I had no idea what I was going to do with these chops, but you really can’t go wrong with pork chops. So I grabbed my Hamilton Beach Programmable Insulated Slow Cooker and got to work. Honestly, this recipe sounded a little too simple. I thought it would just taste like a lightly breaded skillet pork chop. I couldn’t have been more wrong! These Slow Cooker Homestyle Pork Chops are so flavorful and fall apart tender! Sidenote for all my fellow picky eaters out there: I was a little worried about adding dry mustard since I am not a fan of mustard by any means, but it mixes together perfectly with the flavors, and I didn’t even notice it. Michael raved about this…but that seems to be a pattern with all my Gooseberry Patch recipes. More importantly, Ryder LOVED these. We have a bit of a hard time getting him to eat meat. I think he isn’t sure about the texture. 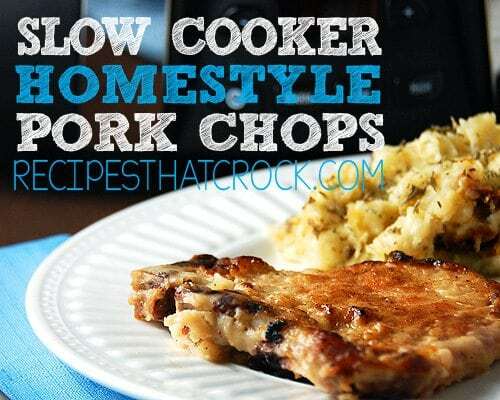 But he was very eager to eat these yummy Slow Cooker Homestyle Pork Chops. Mommy score! Coat your pork chops with the mixture. Brown the pork chops in a skillet with the oil. Take the leftover mixture and stir together with the chicken broth and pour into your slow cooker. Cook and cover for 2 1/2 hours on high. Serve up and enjoy! These go really well with Creamy Ranch Crock Pot Potatoes too! I’m going to try this in my Ninja cooker tomorrow. Thinkin’ that I can brown the chops using the stovetop setting then turn to slow cooker setting to finish off….one pan!